On April 25, 2017, two U.S. Air Force F-35 stealth fighters paid a quick visit to Estonia. And they weren’t alone. Besides the usual KC-135 tanker, a surprising three surveillance planes accompanied the F-35s — an RC-135U and two RC-135Ws. The F-35As belonged to the 34th Fighter Squadron from Hill Air Force Base in Utah. The squadron deployed to Lakenheath in the United Kingdom in mid-April 2017 as part of the U.S. Air Force’s first overseas F-35 rotation. According to the aircraft spotters, airband listeners and ADS-B monitors who tracked the F-35s’ jaunt to Estonia, the two F-35s — serials 14-5102 and 14-5094 — used the radio callsign “Conan 01.” A 100th Aerial Refueling Wing KC-135 using the callsign “Quid 89” accompanied the Conan flight as it departed Lakenheath at 7:35 Zulu time. The trio landed at Ämari in Estonia shortly before 11:00 and took part in a brief ceremony. Meanwhile, as many as three RC-135s — including a Royal Air Force model — operated in the airspace over or near to Estonia. The U.S. Air Force dispatched RC-135W Rivet Joint 62-4139 “Haiti 79” and RC-135U Combat Sent 64-14847 “Spool 06.” The Rivet Joint positioned off Kaliningrad Oblast, where some of the most active Russian bases in the Baltic region are located. The Combat Sent flew a racetrack pattern over Estonia, not far from the border with mainland Russia. Shortly thereafter, an RAF RC-135W “Airseeker,” one of the three ex-USAF KC-135 tankers the British converted to the Rivet Joint standard starting in 2011, flew from RAF Waddington to join the surveillance effort. The RC-135s are equipped with all sorts of antennae and sensors that allow them to eavesdrop on enemy signals and transmissions, detect frequencies used by radio and radars and pinpoint sites of interest such as missile sites. At 14:43, the two F-35s departed Ämari to return to the United Kingdom. The U.S. and RAF spy planes also headed back to their home bases. 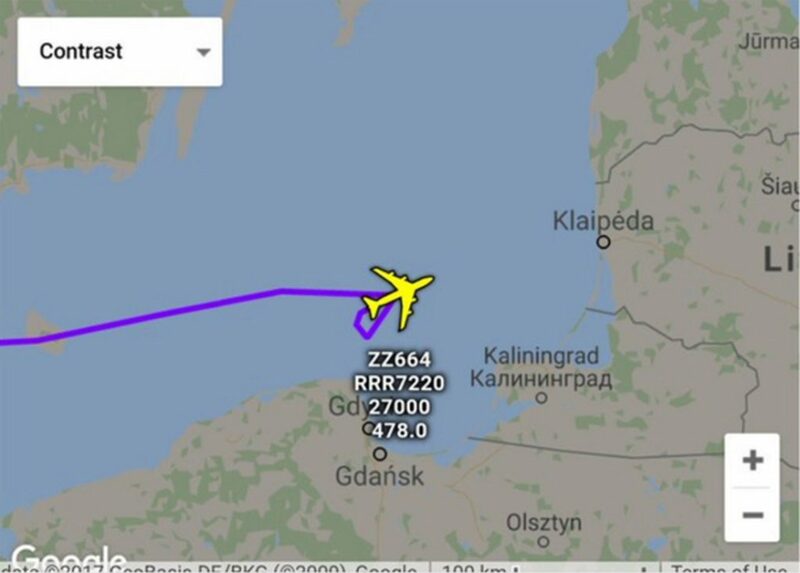 It seems that the RC-135s’ missions to the Baltic were related to the F-35s’ deployment close to the Russian border. While Rivet Joint and Combat Sent aircraft regularly fly to the region and can be tracked online as they head toward the international airspace around Lithuania, Estonia and Latvia, the presence of three such spy planes in the same area suggests that their missions were coordinated. It’s worth noting that the Combat Sent took up an interesting position east of Ämari, as if the RC-135U — an aircraft designed to collect technical intelligence on adversary radar emitter systems — was there to detect emissions from Russian radars interested in the F-35. This story originally appeared at The Aviationist.